As a 5ft2 I'm not the tallest of girls so find it very difficult to find a maxi skirt that doesn't swamp me although with this skirt my huge platforms help! A few seasons ago I started to notice a big trend in pairing maxi skirts with knitwear, two items I associate with two very different seasons but a trend I happily welcomed! It is a little tricky to get the look right though as tucking knitwear into something high waisted does result in all this bulk of fabric making me look and feel a few sizes bigger! I'm starting a new job tomorrow! Very exciting! I'm doing some xmas temp work over the holidays to earn some extra money as I've now brought everyones xmas pressies so starting to feel the pinch! I've just noticed I've created over 100 posts this year! 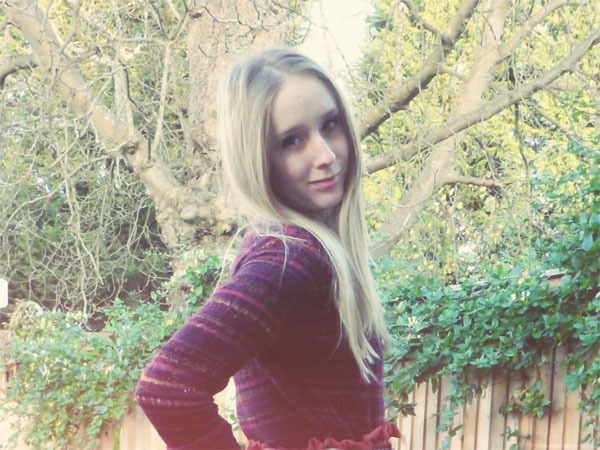 Also had a little move around with some things on the blog so its easier to read etc. including a new profile picture at the top of the sidebar! I've changed the url too so you can now find us at www.sarahloves.co.uk. 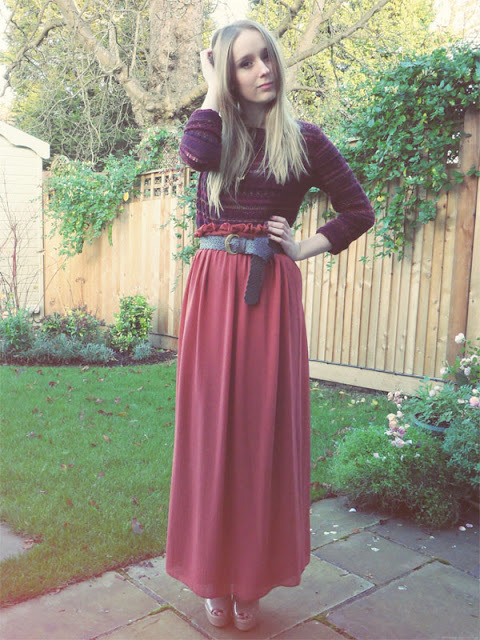 I really like the colour of your maxi. You picked the perfect jumper to go with it, the colours mesh so well! I'm super short too so whenever I wear maxis I have to wear super tall platforms haha, and then hope I don't trip while walking up stairs. The skirt length is seriously amaaaazing! <3 I love the belt with it too! The skirt sure does make you look a lot taller. I like the rustic color. So pretty! 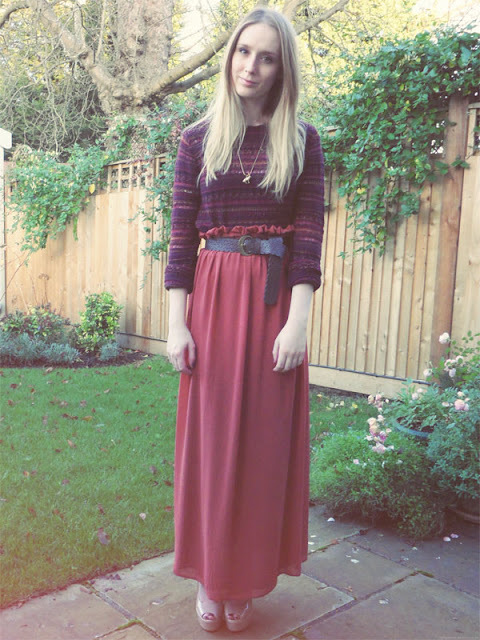 I love the maxi skirt and how it's cinched in with the belt. The sweater is so cute, great outfit!! Love the color of your maxi skirt and great kicks! You look beautiful, so chic. 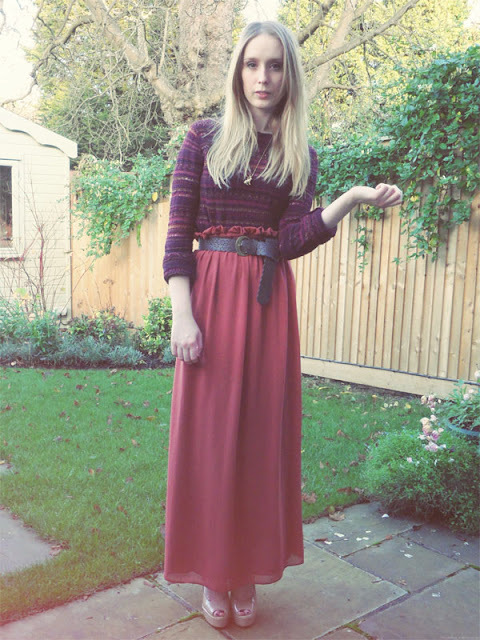 This looks gorgeous, I hadn't thought to pair my maxis with knits but this looks perfect! I love this outfit, super cute. The colours are gorgeous together! lovely post, you're so pretty! Love this outfit and its colours!